There is one scene in Michael Moore’s Capitalism: A Love Story where its writer, director, hero and sole credited actor is examining the copy of the Constitution that is on display in the National Archives. He asks a guard — this is the kind of thing Mr Moore routinely does for effect, pretending he doesn’t know that the guards are not constitutional experts — where in the document before him there is any mention of free markets, free enterprise or capitalism. He can’t seem to find those words. Could it be that they’re not there? And, if they’re not, does that mean that they’re not constitutionally protected? Not, of course, that one could imagine its mattering to him if they were. But without a specific mention, presumably, we must suppose that these "evil" things — he has the testimony of two lefty priests and a bishop to that effect — must have been snuck into America’s constitutional arrangements at a later date by, well, capitalists — or other, equally unscrupulous sorts. In fact, he makes an interesting point, if he but knew it. For the reason "capitalism" is not in the U.S. Constitution is that no one at the time of the American founding had ever heard of any such thing. Private property, of course, they knew about, and there is quite a lot about that in the Constitution — especially about protecting it from government predation. But capitalism? No, sorry. Doesn’t ring any bells. How could it? The term was a later invention of socialists like Mr Moore, themselves a new thing beneath the heavens, seeking to ideologize the world as they found it. The point was to represent reality itself as nothing but a less attractive rival to a suppositious unreality that they called socialism. If once people accepted that this nasty sounding "capitalism," carrying with it all the sorrows and disappointments of real life, were on all fours with the much nicer-sounding "socialism," its historical charge sheet at that point quite blank, they might begin to get the idea that this illusory mental construct was an intellectually legitimate alternative reality. It’s not. If we’ve learned anything from a century in which the record of economic failure of governments calling themselves "socialist" is exceeded only by the hundred million-odd souls numbered in their necrology we’ve learned that much. "Capitalism" is just the socialist word for life — life in its natural state, life untrammeled by regulations imposed by bureaucratic rent-seekers, life that, even under socialism, goes on in the form of more or less tolerated black markets. Yet, amazingly, we remain still so oblivious to this act of lefty legerdemain that conservatives continue to invite Mr Moore to pin on them all the sufferings of the economically deprived or imprudent by proudly calling themselves "capitalists." Don’t we know that capitalists are the people who cozen people out of their homes by making loans to them that they can’t afford to repay? This is just one of the many sins that Mr Moore attributes to these mythical monsters, the diabolically clever exponents of a "system" designed to make a few people rich and the mass of people poor. For him, "capitalism" is an evil force with supernatural powers, and the pantomime theomachy between this "capitalism" and Mooreism, which is fitfully and inconsistently identified with "socialism," here finds a new lease of life. Or at least it seeks one. Whether or not any significant number of people are going to take Mr Moore’s movie as anything but the joke he, in effect, admits it is remains to be seen. For it seems to me that even the most convinced socialists will be hard put to it to find any coherence in this random selection of crooked or rapacious business practices, first person accounts of the sufferings of those who have borrowed imprudently and had to pay the price, moralizing about labor markets that pay what he regards as too little to some and too much to others and sneering about the politicians whose 2008 bailout of the financial markets he calls "a financial coup d’état." It’s clear enough what Michael Moore is against, which is poverty and suffering and shady dealing. It’s also pretty clear that he thinks those who don’t agree with him about what to do about these things actually like them and want there to be more of them. Not so clear is the chain of reasoning by which he arrives at such an extraordinary conclusion, and not clear at all is how, in practice, the non-capitalist alternative he proposes (he is oddly shy about using the word "socialist") would work. Argument, in other words, is not Mr Moore’s strong suit, as those who have sat through his previous films — Bowling for Columbine, Fahrenheit 9/11, Sicko and so forth — may be aware. 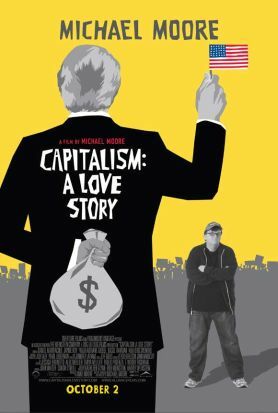 Like those pictures, Capitalism: A Love Story is a melodrama, and like all good melodramas it has not only an impossibly wicked villain but an impossibly good hero. And if the villain is the spectral capitalist, the hero has an embodied existence in the shape of Franklin D. Roosevelt who, we are told, had planned to pass into law a "Second Bill of Rights" which would by legislative fiat have made everyone healthy, wealthy and educated, if he had but lived long enough to do it. Alas, he died only just over a year after announcing this revolutionary idea and presumably had other things to do during that year. In Mr Moore’s words, "none of this came to pass. Instead, we became this," — and so we cut from the old newsreel of FDR to color news footage of the Katrina disaster. It’s that darned capitalism again! Wherever you find human misery, there it will be, apparently. Capitalism makes the winds to blow and the waters to rise, and only an act of government can stop it! "We all deserve FDR’s dream, and it’s a crime that we don’t have it," says Mr Moore’s peroration. Does anybody really believe anything so preposterous? You wouldn’t think so, but our political debate is now so debased that lots of people apparently do. At least a lot of the people who go to movies. A bunch of them applauded at the end on the night I saw it. They presumably believed him when he said that "Capitalism is an evil, and you cannot regulate evil. You have to eliminate it." Well, if people are suckers enough to believe that all the world’s problems are caused by a few "evil" capitalists, then they will also be sucker enough to believe that the problems can be put to rights by passing laws against capitalism. The question is, does Michael Moore believe it, or is he just playing with us? I wonder if he knows himself. Consider, his sub-title: "A Love Story." In a way it is, too. Mr Moore suffuses stories from his own childhood in Flint, Michigan, with a nostalgic glow. His father had a good job in a General Motors spark plug factory, made a good living and raised an apparently happy family. Dad had four weeks’ summer vacation every year and a new car every three years. Little Michael even treasures fond memories of the nuns at his parochial school. Those were the good old days, and if the motor industry, along with Flint, has fallen on hard times, it has to be somebody’s fault. That’s what capitalism was invented for. F. A. Hayek thought that socialism was a species of nostalgia for an imagined past, and this movie seems to bear him out. Its best moment comes during one of Mr Moore’s stunts where he’s asking random people on Wall Street if they can explain credit default swaps to him. "Can you give me any advice?" he cries. One of the passers by says to him, "Yeah. Don’t make any more movies." All credit to him for leaving that in the final cut. Now he should take the advice.